You are the monster, the monsters are you. All the enemies (and bosses) are versions of your character. There are two bosses. If you defeat both of them, you win (the bosses are to the right, so you will have to move right to get to them). Jumping is useful later in the game, just remember that you can also attack while in the air. I really like how the progress bar turns into the boss's health bar. Boss fights were definitely the highlight of the game. It was interesting figuring out how to beat them given the mechanics. Nice minimalist pixel art and liked the little touch of being able to sit on benches. Did have issues with the attack though where I seemed to get hit when I would come flying back into position. I really like the graphics. The characters are kinda creepy. Nice complete entry. I first found the combat a bit impenetrable, and then later a bit tiresome. Really like the simple pixel art graphics. Found the attack charging/combat confusing at first though. very nice atmosphere! graphics really set the mood. I didn't truly love the attack, but I do like the look of it! Cool look, interesting simplistic mechanics. I liked it. Can you restart from the game over screen without just refreshing the page? While the combat looked good it wasn't too much fun, and doing the same stuff got a little tedious by the end. Final boss and jumping enemies were a nice change tho. The graphics and sound were nice and simple. The gameplay was fun and the bosses added some much needed variety. Overall, a cool entry! 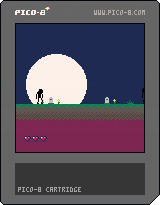 Love these PICO-8 games :) You people are doing really gool things with it. It would have been nice to have the ending tie in the dialogue given at the beginning about battling your inner demons, just to give some kind of resolution. Other than that great job! The graphics are quite nice, I liked the second boss fight but I found the combat mechanics a bit too simple. Coulnt finish the final fight but yeah was almost there. Neat game. Also i loved sitting texts. This feels a little bit slow paced, but I love the graphics. Pico-8 is fantastic looking. Minimalist yet amazing entry. Good job one this one, Azlen ! Very well done game and narrative, the restart thing would be helpful, but other than that, I don't have much else to add. Simple but effective. The atmosphere was good. I felt a bit lost and confused at first with the mechanics. Nice game! I love pico8 games. So simple and charming. Your graphics really stood out, and set the mood of the game. The game play was a bit repetitive, but the last boss fight was a lot of fun. I would love to play an expanded post-compo version. Nice game! The two bosses are the real game (maybe a future boss rush mode? :) I really like the attack system, if feels fast and powerful but I miss a small animation on impact. Nice secrets :D and nice feeling overall. Good job! Excellent atmosphere and I really like the little touches like the benches and other text. Cool, I particularly liked the use of the P8's colors to make a moody palette. Very atmospheric, but a little tiring after a while. Enjoyed all the messages written on the benches, and the bosses felt just a little out of place given the serious tone. Still, great work!